Written and directed by Taylor Sheridan, Wind River is the story of a young FBI agent who helps a tracker find a murderer at an Indian reservation in Wyoming. The film is an exploration into the world of Native Americans and how two different people try to do what is right as they also explore the dark aspects of their surroundings. Starring Jeremy Renner, Elizabeth Olsen, Gil Birmingham, Jon Bernthal, and Graham Greene. Wind River is a riveting and somber film from Taylor Sheridan. An 18-year old Native American woman is found dead by a wildlife tracker as he is aided by a young FBI agent who wants to know if it was a homicide as they deal with not just their surroundings but also the sense of tension among the Native American community in a small town in Wyoming. It’s a film that isn’t just about a murder in an area that features a prominent Native American community in this small Wyoming town but also a man who knows that girl as she was the best friend of her daughter who had died a few years earlier. Taylor Sheridan’s screenplay isn’t just about the mystery of who killed this young girl but also the neglect towards Native Americans as it relate to them being victims of crime despite the fact their local sheriff in Ben (Graham Greene) is a Native American who cares about them but isn’t given enough resources to do justice. Yet, the Native Americans do have an ally and friend in Cory Booker (Jeremy Renner) who is agent for the U.S. Fish and Wildlife Service that tracks wild animals that is harmful to any farm animals as he is first seen killing wolves from afar for trying to attack a herd of sheep where he would find the body of this girl in Natalie Hanson (Kelsey Chow). The idea that Natalie could’ve been murder catches the attention of FBI agent Jane Banner (Elizabeth Olsen) who arrives to Wyoming unprepared for its conditions and the land itself as she believes that it is a murder. Banner is definitely the outsider as someone who hasn’t been on the field nor does she know how to conduct herself as a Caucasian in a Native American community as she needs Booker to help her. Booker’s role in the investigation is personal as he is still reeling from the loss of his daughter a few years ago that led to him being separated from his wife as he makes a promise to Natalie’s father Martin (Gil Birmingham) to find out what happened. Even as he has to contend with some in the Native American community who don’t like him because he’s Caucasian yet is one of the few that can actually help them. Sheridan’s direction is definitely exquisite in terms of the setting and locations though it is actually shot in Utah as part of this small town in Wyoming with areas near the Rocky Mountains. Much of the direction is quite simple as it play into this very cold and snowy land that is Wyoming in the northwestern part of America as it features images of the Native American community feeling disconnected from traditional society as there’s a shot of the American flag shown upside down. For someone like Booker, he understands their disconnect as he too is disconnected from traditional society due to his grief yet is still trying to be a good father to his son Casey (Teo Briones) as well as help out his ex-wife’s parents. While Sheridan would use a lot of wide shots to capture the scope of the locations, he does maintain an air of intimacy in the close-ups and medium shots as it relates to the investigation and the interaction between characters during the non-investigation scenes. Sheridan would take his time in letting things unfold for the film’s climax where he would put in something that is a major reveal about what happened but also this air of isolation that is prevalent to those who aren’t part of conventional society. It adds to this harrowing conclusion that emphasizes on this neglect in American society towards not just Native Americans but also this region such as Wyoming, the Dakotas, Utah, and areas with Native American reservations that doesn’t seem to really be part of the United States of America. Especially when it comes to justice as there are very few instances where the right thing is done yet America is more concerned with what’s happening in other parts of the country and the world rather than those who were in this country first. Overall, Sheridan crafts a gripping and chilling film about a tracker and a FBI agent trying to find out who killed an 18-year old Native American woman. Cinematographer Ben Richardson does excellent work with the film’s cinematography in the way many of the daytime exteriors are presented with its emphasis on natural lighting with the scenes at light displaying some low-key lighting for some scenes including the exterior settings in some scenes. Editor Gary D. Roach does brilliant work with the editing as it is straightforward for much of the film with some rhythmic cuts to play into the suspense and action. Production designer Neil Spisak, with set decorator Cynthia A. Neibaur and art director Lauren Slatten, does fantastic work with the look of the homes of Booker, the Hanson family, as well as some Native American junkies who live in trailer parks. Costume designer Kari Perkins does nice work with the costumes as it is mostly casual with the look of the uniforms the deputies wear with winter hats and such as well as the winter gear that Banner had to borrow on her search of the murder site. Hair/makeup designer Felicity Bowring does terrific work with some of the makeup as it relates to the sense of loss that Martin Hanson is dealing with as he’s wearing war paint to express his grief. Visual effects supervisor Dottie Starling does some fine work with the visual effects as it is mainly set-dressing for a few exterior shots in the film. Sound editor Alan Robert Murray and sound designer Tom Ozanich do superb work with the sound as it play into the atmosphere of the locations as well as the sound of gunfire and such throughout the film. The film’s music by Nick Cave and Warren Ellis is amazing as it is a major highlight of the film for its mixture of folk and ambient music with violins to play into the somber tone of the film while the rest of the soundtrack consists mainly of folk and country music. The casting by Jordan Bass and Lauren Bass is incredible as it feature some notable small roles from Tantoo Cardinal and Apesanahkwat as Booker’s former in-laws, Eric Lange as the local autopsy official, Tokala Black Elk as a notorious junkie in Sam Littlefeather, Martin Sensmeier as Martin’s estranged drug-addict son Chip, Teo Briones as Booker’s son Casey, Althea Sam as Natalie’s mother, Kelsey Chow as Natalie, Julia Jones as Booker’s estranged ex-wife Wilma, James Jordan as a man working at an oil rig in Pete, and Jon Bernthal as an oil worker named Matt who was seeing Natalie on the night she died. Gil Birmingham is excellent as Martin Hanson as Natalie’s father who is given the news about his daughter as he succumbs to grief and anger while asking Booker to do what is right. Graham Greene is brilliant as Ben as the town’s local sheriff who is also Native American as a man that had seen a lot as he tells Banner about how things work in the town as he also hopes to do what is right for everyone. Elizabeth Olsen is phenomenal as Jane Banner as a rookie FBI agent who is given her first real test as an agent while being someone that is an idealistic in wanting to do what is right as she also copes with the severity of her assignment and what she has to do to get things done. Finally, there’s Jeremy Renner in a sensational performance as Cory Booker as a U.S. Fish and Wildlife Service agent/tracker who would find the body of this young woman forcing him to deal with his own loss from years ago where he would help Banner and others find out who killed her as well as gain some redemption for how he lost his own daughter. 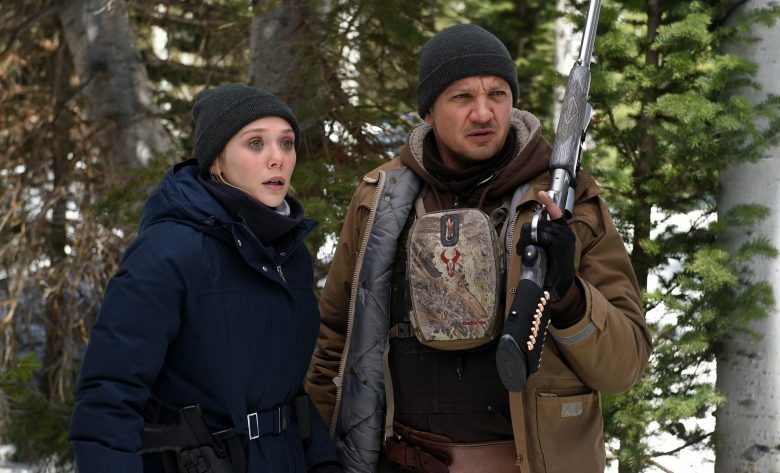 Wind River is a tremendous film from Taylor Sheridan that features top-notch performances from Jeremy Renner and Elizabeth Olsen. Along with its supporting cast, themes on justice and neglect, eerie music score, and a chilling setting. It’s a suspense film that doesn’t play by the rules while acknowledging the sense of alienation and neglect towards a group of people who never have things go in their favor. In the end, Wind River is a magnificent film from Taylor Sheridan. I'm glad you got to see this! I agree with your review, great film.